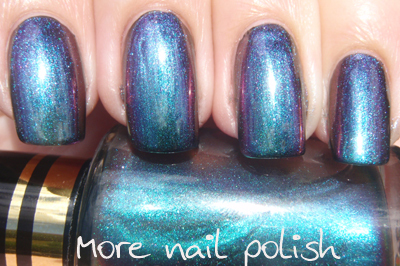 Hang on a minute; didn't I just do a post on this polish yesterday? Well yes and no. 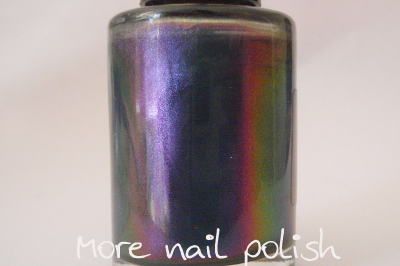 This is one of the Artform Revolutionary Range polishes - #505 Green Purple, that I got in my haul last week. 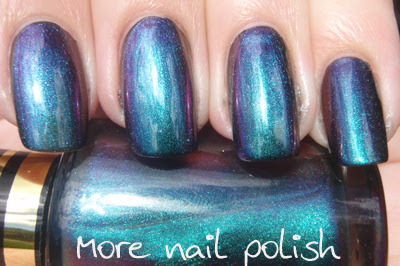 Let me just start by saying this is an exact dupe for yesterday's polish, Sally Hansen Turquoise Opal. The very last photo shows a comparison swatch. 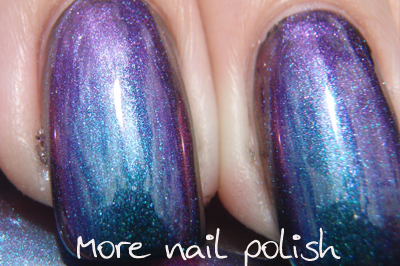 The other interesting thing is that I’m sure this is also an exact dupe of Ozotic Pro #505. Recently when I wrote about ordering these polishes, Kira from over at Kira and Lydia's Makeup, said she was keen to see these as she didn’t want to double up on her Ozotic Pro colours. Well Kira, right you are! 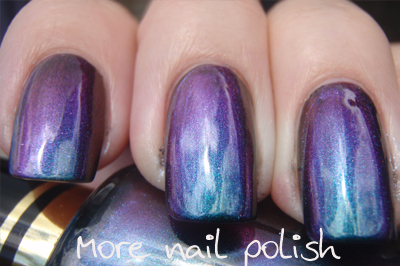 What I find very interesting is that not only do they appear to be the exact same multichromatic polish, but they also have the exact same number! And even more evidence that these are probably from the same Australian manufacturer, is that it’s not just this one polish. 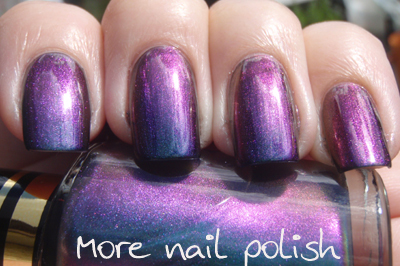 I ordered six multichrome polishes (#502, #503, #504, #505, #506 and #508) from Artform Nails. 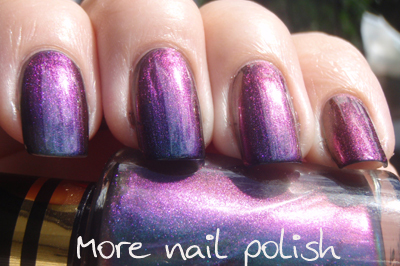 From looking at other people’s swatches and reading the colour descriptions of Ozotics #502, #504, #505, #506, all four of these polishes are exactly the same number and colour as the Artform ones. So the cool part is that I read a comment from Kaz over at Pretty Random saying that Ozotic Pro #503 and #508 are discontinued. So how cool is it that after looking at the Ozotic Pro colour chart, I have probably located exact dupes of #503 and #508. Just remember that these actually cost a little more than the Ozotic pro ($10.95 v $8.50). But if you want to get #503 and #508, it’s probably worth the extra few bucks. Anyway, onto the swatches of Artform #505. These were all three coats over a black base. I really wanted to photo the comparison between Sally Hansen Turquoise Opal and #505 in the sun, but the clouds came over and I had to do it under then bathroom lights instead. 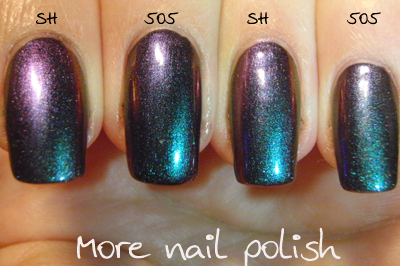 As you can see even in this indoor flash picture, both Sally Hansen Turquoise Opal and Artform/Ozotic Pro #505 are dupes. I'll be bring you more of these duochromes in coming posts. If your a green lover, just wait until you see the discontinued #503. Ah-maze-zing. 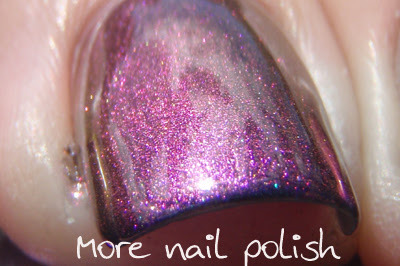 now i want this polish!! Perfect dupe!!! I'm so getting the Artform one, they do such amazing colors! I appreciate the swatches I wonder if ozotic 508 is the same as ozotic 521...its a golden/purple and I have no 508 to compare against. I am a little annoyed I missed out on 507 seeing ozotic doesn't look like they have something similar. Yeah - bummer about 507. 508 is very purple and very orange. Do you have 521? you'll have to tell me if it looks similar when post 508. Oh wow, it just looks fantastic mid-colour change!